I absolutely love chili especially Instant Pot Chili, however, I hate the beans. This was my first go at White Chicken Chili in The Instant Pot and it turned out great. You basically dump and cook this recipe and within a short cook time, you are ready to fill your dinner bowls with delectable soup. It is painless and hearty and only has 3 net carbs per serving. This is the perfect soup to serve up if you are on a low carb diet trying to watch your intake. I recently started a low carb diet, and this soup was a blessing. Many people get fired up to start a diet and then day two or three they fall off the wagon. Now I am not judging as I have been guilty of this in the past, and I figured out my issue with dieting. I struggled so much with finding lunches and dinners that fit into my diet plan but were appealing to me. I don’t want to eat the same three things over and over again that has no flavor. 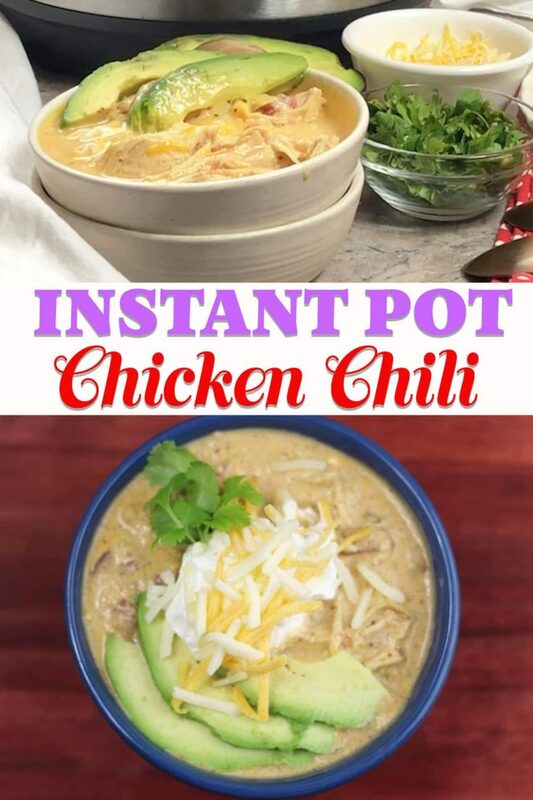 That is where I gained the inspiration to make this Instant Pot white chicken chili. It fit into the carb intake and offered rich and creamy flavors that actually were pleasing to my palate. I topped it with some avocado, to up the protein a little bit, and it was amazing. The kids even ate it, which was a huge win for me. Then I used the leftovers to meal prep for a few days for me. It made sticking to this lower carb diet a lot easier, and I can even freeze this soup and reheat for later too. 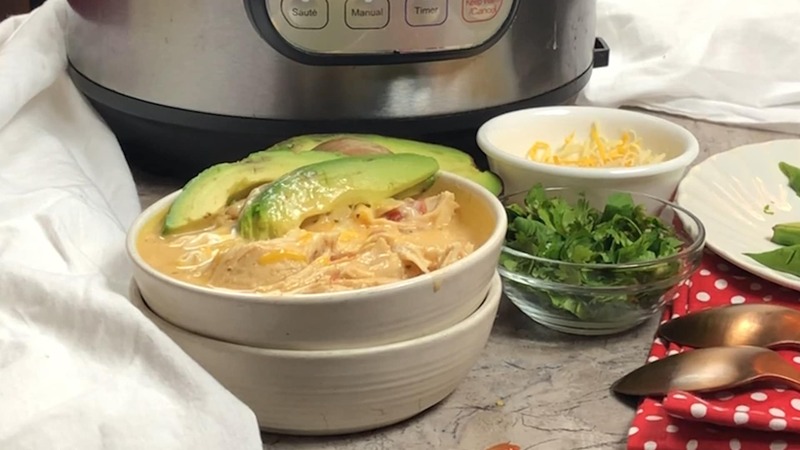 This is a great instant pot frozen chicken recipe, that you can add to your list. I didn’t have any thawed chicken handy, so I used frozen chicken and it cooked to perfection in the Instant Pot in no time. 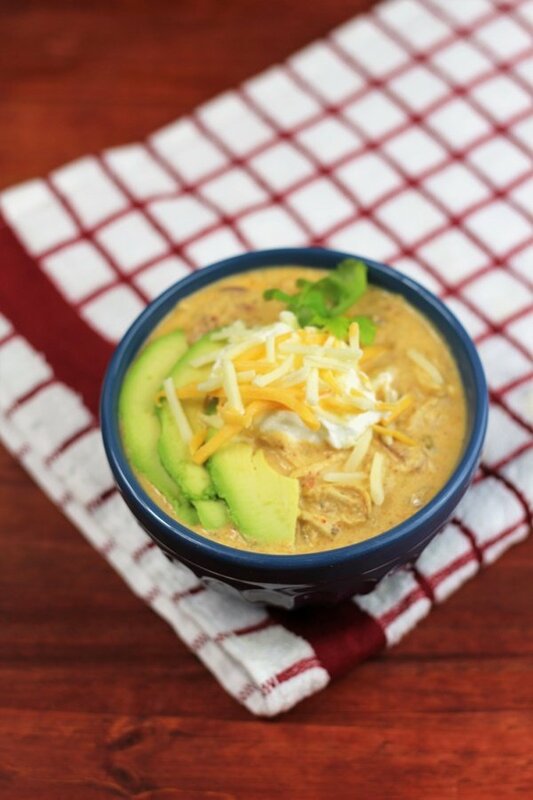 It was tender and juicy and shredded perfectly for little bites of chicken in each a bite of this instant pot white chicken chili. You can also grab other toppings to let your family add what they want for added flavor. A dollop of sour cream, a splash of hot sauce, oyster crackers for dipping, and each member of the family can customize the soup so that they enjoy every drop of it. 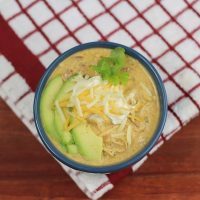 I loved being able to create this chicken chili with no beans to fit my diet needs. So often I see chili recipes that use beans, and I finally brainstormed, why not get in the kitchen and make a chili that fits what I want. Instead of taking time searching, just play around and see what comes out of it. To my surprise, a new favorite chili recipe came out of it. I have been making this chili for a while now and so glad I took the time to try, because the flavors are perfect, and I am happy with the creamy texture, it makes for a comforting bowl of chili. 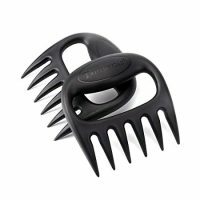 Shredder Claws are a huge help for getting your chicken shredded in seconds. Just cook your chicken and then use the claws to help pull apart the meat. It shreds the chicken beautifully. 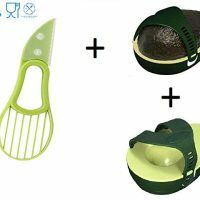 You can use this on other cuts of meat like pork or beef as well for the same shredding results. A perfect soup for any time of year. I especially love eating this on cold winter days, or chilly spring days where it is raining outside. 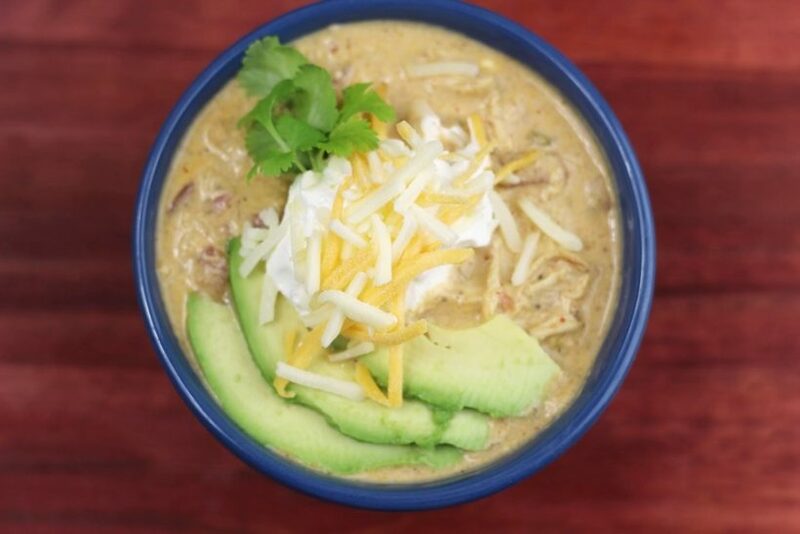 Grab yourself a bowl of this chicken chili and curl up on your couch with a warm fuzzy blanket, and just enjoy your day at home watching Netflix or binging your latest DVR’s. 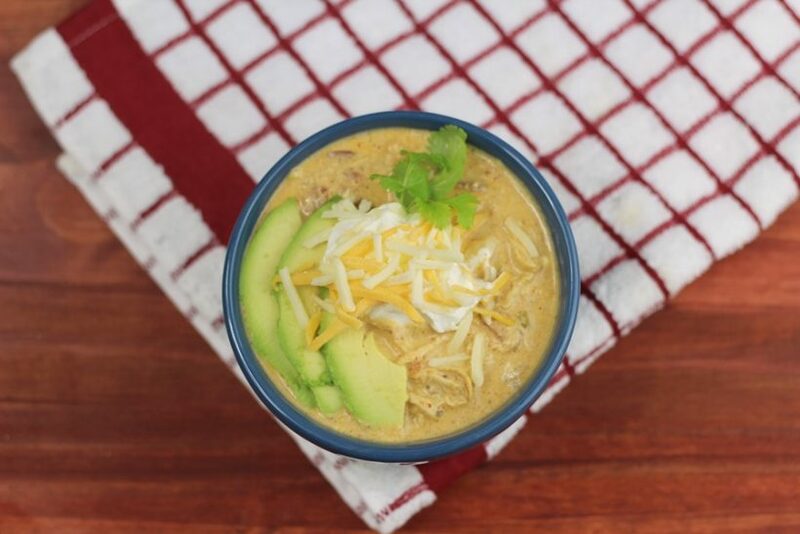 This Instant Pot chicken chili is only 3 grams of carbs. If you aren't low carb and like the beans add a can of great northorn beans for a more traditional recipe. Place chicken, frozen into the pressure cooker. Add all other ingredients except anything that is for garnish, adding cream cheese last. Cook at high pressure for 15 minutes then NPR 15 minutes and QR any additional pressure. Remove lid and carefully remove chicken and shred then stir all ingredients together. Serve with any of the above garnishes or any of your favorites. This turned out more soupy than chili. When it was done, I placed it on “sauté setting and got it boiling and added some cornstarch. Let it sit awhile and it will turn thicker as it cools. I did double the recipe and would recommend not to add an extra 8 oz. of cream cheese. I ended up cooking an extra 15 minutes on high pressure and the cream cheese was not melted, so either you can add less cream cheese or cook it extra time. Yes – I also doubled the recipe and it came out the exact same way. Thanks for sharing what you did to fix it. The flavor is great, though! If you double the recipe, do you have to double the time? 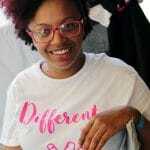 This is my first pressure cooker recipe. This recipe looks amazing and I want to try it. Forgive me for my ignorant question but I am fairly new at using my instant pot and was curious what you meant by “NPR 15 minutes” and “QR any additional pressure” I think that means you cook it for 15 minutes then release the pressure but don’t open it for another 15 minutes (the clock will tick upwards) and then add additional time if the chicken is not done. Is that correct? Thanks for your help and looking forward to making this dish. Once the pot stops cooking let the pressure release naturally “NPR” natural pressure release. Then quick or manual release the remaining pressure”qr” quick release. Made this tonight. My first time using a pressure cooker. Definitely more soupy than chili, but tasty! I am going to make this for dinner tomorrow night, and I am wondering, if you want to make it less “soupy” could you not add as much broth? Would this compromise the recipe? I don’t see why not, chicken makes its own liquid, so I think that’s why mine came out a little soupy. Let me know how it goes. Have any of you made it with thawed chicken? How did that change the cooking time? Have any of you made it with thawed chicken? How does that change the cooking time? Thanks! I’m trying it now. Thanks!! Well, I think there is a mistake in the recipe. It calls for 2 teaspoons of salt which I put in. It was extremely salty. I had to throw it away. I wasn’t sure if I was supposed to drain the can of tomatoes and chilies, so I added the liquid from the cans to the pot. I reduced the chicken stock by about a cup. My main concern was that the cream cheese didn’t melt at all. It looked like cubes of tofu, and even whisking it didn’t really melt the it/blend it in. I would definitely not call this a chili. So good! This is definitely full of flavor. As others have mentioned, this is a soup instead of chili but that doesn’t bother me. I didn’t have a can of green chilies on hand so I just omitted them and it still turned out great. Next time I will half the salt though. Thanks for the great recipe! This was delicious even though my cream cheese ended up looking curdled by the end–next time I think I stir it in after everything is cooked and shredded. It was “soupy” but that didn’t bother me. Great flavor for something so simple! 2 tsp of salt was perfect–didn’t have to go back and season more after cooking. Good stuff! Agree with the others re:consistency, it was a soup. I think the cream cheese may be better melted in after the cooking though. Good flavor though. I love this recipe BUT I did make a few adjustments after making it the first time. 32oz chicken broth is way too much. I cut it to 1 cup. Still very liquid, but the right amount. Also 1 cup canned diced tomatoes. I can’t find a can of green chilies around here so I sub 1 tsp of super hot minced indian green chili (from a bottle, a little goes a long way). Avocado is a MUST, so delicious, and a baguette to mop up all the liquid is amazing as well. Great recipe! I loved it! But I changed a few things based on what I read on the reviews. I did 2 pounds thawed chicken- same time. Put it all in the stand mixer to shred the chicken and mix the cream cheese smoothly! Ok. Is cream cheese added as last ingredient prior to 15 minutes of high pressure, or at the very end, after QR and chicken is shredded? Step 4 tells you to shred chicken and you add the cream cheese before the 15 mins. I’d love to make this but I don’t have an instapot. 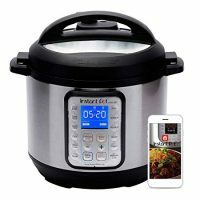 Can you provide directions for cooking in a crockpot with thawed chicken please? Thanks so much! I made this tonight and one of my kids went back 3 times to get more. I did change a few things and used the suggestions from others. I melted the cream cheese and sour cream over the stove and then added it after I shredded the chicken. Thanks for that tip by the way! I didn’t add any salt but that’s just because I personally try to have little or no salt and no one at the table asked for salt so… I guess you can try it without if you want. This was amazing and I’ll be making it again. This turned out SO DELICIOUS! I have to admit I read some of the previous comments about it being too thin, so I only added 10oz of chicken broth & once the chili was done I added a slurry of 2tsp of cornstarch. Set my instapot to sauté and let it thicken for about 4 minutes. One other change I made was I opted for low-fat cream cheese- still fabulous!!! I won my office chili cookoff with this recipe today! Thank you! After reading other recommendations, and making this once before, I halved the amount of broth, and it was much less “soupy”. I also didn’t add the sour cream until after I had opened up the Instant Pot. It definitely helped to avoid the “curdled” look on the cream cheese. I added about 1 T of cornstarch for a thickener as well. Absolutely love how easy this is to make, and how delicious it is. Agree that as written, it was way too soupy to consider it chili. Also the directions should be more clear on when to add the cream cheese, as that seemed to be an area of confusion. Adding it BEFORE the pressure cooking does make it look like curdled milk. After removing the chicken to shred it, I took half a cup or so of liquid out, and mixed with a heaping tablespoon of flour, and then whisked that in. I put the chicken back in, and turned it to saute. After 5 min, it’s still thinner than I would like – so next time will use less broth. The taste overall was really good – could use half the salt to start and then adjust. Seriously delicious! I added cream cheese after the pressure cook time while in saute and it worked great. Also, hold the salt. I’m a salt person 100%, but this was too much. Just do it after the fact to taste, not during cooking. Also, I didn’t have diced chiles, so I diced up some green bell pepper, and sweet red pepper. YUM!! This was so good! I used thawed chicken breast, and only 10oz chicken broth. I also added a few extra garnishs, chipped red onion, cilantro, and chopped up some sweet tomatoes. This was delicious and easy! I did use thawed chicken and cooked for 25 mins instead of 30. I had no problems shredding it. After reading many comments about it turning out soupy I added about a teaspoon of xantham gum and it thickened right up. Would this be good in a crockpot? If so what would you recommend for cook time? Yes you could in the crock pot, but I’m not sure as far as time.